The next two dates I have bookmarked, now that the rain seems to be on its way out, are May 8th, taking in Glen Canyon, and May 25th in the Presidio. I hope to keep scheduling these more regularly for the next few months. These roams are offered by donation; they are one way I try to be able to afford to continue living in San Francisco! Thank you for your generosity in supporting Roaming Zen. I also figured out how to add in an email sign-up for Roaming Zen, so please scroll down to the bottom if you would like to get these details in your inbox! Looking over to the Sutro Tower and Twin Peaks from the top of Mount Davidson. Grand View is aptly named. 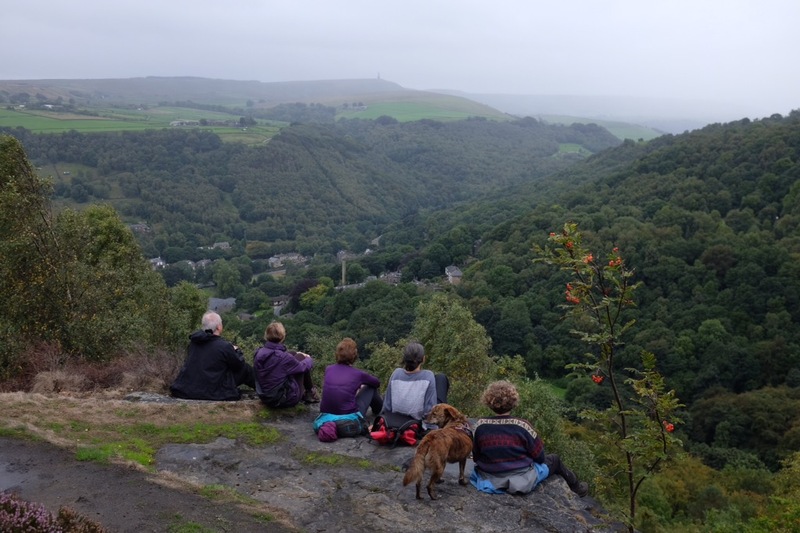 Sitting on the crags by Heptonstall during the second English roam in September. A trail up the side of Mount Sutro. Part of the Lobos Creek trail – a real favourite of mine. The trail down Billy Goat Hill. We will get back there soon. Along the Golden Gate from the Land’s End trail. The genesis for Roaming Zen was perhaps my shuso practice period at Tassajara, where I noticed that I derived as much energy from being on the trails or up the road, among the trees and by the creek, as I did from the hours in the zendo. It was perhaps crystallised by a visit to Tassajara with a group from Young Urban Zen a year or two later: after the days of work, a group of us set off for a hike along the Horse Pasture trail, and at one stage, hearing all the talk of people’s pre-occupations and mundane affairs, someone in the group asked if we could all hike in silence for a while and properly take in the surroundings. Afterwards, the agreed verdict was that the silence had transformed the hike. And so, having tried versions of it at City Center, Green Gulch and Tassajara, one of my main teachings since leaving Zen Center has been to gather a small group of people, sit with them, introduce a little quote or theme, and lead them around a chosen route, cultivating mindful presence through walking and sitting quietly in the midst of city life. There are so many little corners of San Francisco that lend themselves to the activity, surrounded by beauty, views, and sometimes quiet. We have visited hills and canyons, creeks and beaches, staircases and alleys; we have listened to birds and waves, watched butterflies and bees, smelled flowers and ocean spray. We have looked over all sides of San Francisco and to the mountains beyond. I doubt many people reading this need much persuasion about the benefits of hiking, but this article lists some of them. I like to give some credit to OpenStreetMap, for featuring much more detail in paths and trails than I ever get from Apple Maps or Google Maps – I would not have found some of these routes without it. I couldn’t ask for a better quote to sum up Roaming Zen! This should add you to my Mailchimp list, which I use to send out details of roams, and occasionally other information. You are always free to unsubscribe later, and I try not to take it personally!